The British government has offered support to a controversial multi-billion pound plan to drill for oil in one of Africa’s oldest national parks, according to documents obtained by Unearthed. A leaked Total report obtained by Unearthed has revealed that damage to the park has already occurred. Yet documents reveal that British trade officials have classed Tullow’s operations in the park as an “opportunity” worth over £1bn to UK businesses and have been keen to offer the firm financial backing. According to files released under freedom of information, the government has held talks with Tullow about providing UK taxpayer backed loans and insurance for its operations in the country. Uganda is not the only example of British firms wishing to drill in national parks and other protected areas. The findings form part of wider investigation by Unearthed, which found that British companies hold the rights to explore for oil in national parks and protected areas all over sub-Saharan Africa. The UN has cautioned against drilling for oil in national parks due to the potential damage to ecosystems and the well-being of people living nearby. Unearthed scoured oil licence maps collated by OpenOil and found that that 6 British companies hold exploration licences covering at least 29 protected sites in 8 countries. This trend is at odds with the position of international institutions. The International Union for Conservation of Nature (IUCN), which partners the UN in monitoring protected sites and endangered species, has a strict “no-go” policy regarding mining activities in protected areas. Tullow has refused to rule out drilling in protected areas, although it said it does have a policy against drilling in world heritage sites. According to Tullow 40% of Uganda’s oil lies beneath Murchison Falls national park but the company’s plans to extract it have sparked fears over the future of the park’s wildlife. A recent BBC documentary narrated by David Attenborough followed the efforts of conservationists to relocate some of the population of endangered Rothschild’s giraffe to protect them from oil drilling. According to a leaked report obtained by Unearthed, small scale but irreparable damage has already occurred to the park as a result of a geological survey. The ecological compliance study, commissioned by Total, found 283 instances of damage, 159 of which were were found to be “non-restorable”. This included oil leakage; damage to trees and riverbanks and the destruction of termite mounds. A presentation by trade officials earlier this year further outlines the government’s backing for British companies looking to benefit from oil drilling in Murchison Falls. Government officials are supporting the project, which they hope will provide a cash boost to the country. “The oil revenues are likely to transform Uganda’s economy towards economic growth if there is effective oversight,” adds Ssekyana. 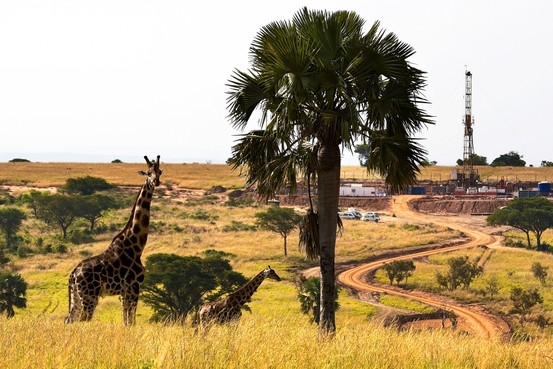 Tullow holds an equal stake in three key oil blocks in Uganda – together with French oil major Total and Chinese state oil company CNOOC – one of which overlaps Murchison Falls. Tullow told Unearthed that, together with its partners, it would be investing $8 billion and drilling 500 wells in the three blocks, over the next 25 years. The area earmarked for the most intensive development lies within Exploration Area 1 (EA1), operated on behalf of the group by Total. Seventy percent of EA1 overlaps with the national park, including savannah habitat used by the endangered Rothschild’s giraffe, lions and elephants. “Tullow is one of very few oil & gas companies to rule out operating within in World Heritage Sites. In Uganda, the environmental planning for the Lake Albert Development thus far has been substantial and we will comply with all relevant IFC standards. Documents seen by Unearthed reveal that the UK government has long been supportive of Tullow’s efforts to drill in the region – even offering financial support to the driller. The firm, whose chief executive is a major Conservative Party donor, has been in talks with officials over various schemes to back the production phase of the $8bn venture. Minutes from a phone call between Tullow and UK Export Finance (UKEF) in May 2015 reveal talks about “possible options for UKEF assistance” for Tullow’s operations in East Africa. The minutes highlight Tullow’s oil interests in Uganda and a crude oil pipeline viewed as key to making extraction there commercially viable, before going on to discuss funding options for the project. Options included a possible taxpayer funded loan linked the export of goods and services from the UK to drill in the park. UKEF also raised the possibility of providing political risk insurance (PRI) to Tullow, asking the company: “What is driving appetite for ECA [Export Credit Agency] involvement over banks? If sovereign risk appetite then UKEF PRI [Political Risk Insurance] could assist”. UKEF political risk insurance provides guarantees to an exporter that, in the event it is not paid by the government or company it is exporting to, the money will be paid by the UK taxpayer. A spokesperson for UK Export Finance said: “UK Export Finance’s role is to ensure no viable export should fail for lack of finance or insurance. It meets with UK companies every day to assess how it can support their export ambitions. George Cazenove, head of communications at Tullow, told Unearthed that the company had held conversations with UK Export Finance in 2015 and 2016 regarding UKEF support. These conversations had been in relation to an oil export pipeline that was to run from Uganda through Kenya, where Tullow also has operations, and then to the coast. Earlier this year the route of the pipeline was changed to run via Tanzania and the project is now being led by Total. Further documents seen by Unearthed suggest that trade officials are likely to maintain their support for the Uganda project. A list of “opportunities” includes Tullow and Total’s projects to drill in and around Murchison Falls; as well as a new oil refinery and the crude export pipeline – both of which are essential to making recovery of the reserves commercially viable. The government has also contributed at least £120,000 to projects to twin the UK oil centre of Aberdeen with African oil hubs, including Pemba and Tanga in Tanzania and the Ugandan town of Hoima. The plan aims to position the North Sea oil sector in Aberdeen to secure lucrative contracts from oil extraction in Uganda in future, including in Murchison Falls. Tullow is one of very few oil & gas companies to rule out operating within in World Heritage Sites. We have very strict and clear procedures with regard to operating in protected areas including full oversight and sanction by our board. Oil & gas is a highly regulated and scrutinised industry both internationally and in our countries of operations. We minimize the risk of impact to protected areas by avoiding them as best we can and managing all our operations to protect the environment. We also mitigate the effect of our operations in protected areas by abiding by all local and international regulation and working with environmental NGOs, government agencies and local communities. In Uganda, the environmental planning for the Lake Albert Development thus far has been substantial and we will comply with all relevant IFC standards. We have committed to protecting a number of species throughout the development and we are obliged to ensure that there will be no measurable adverse impacts affecting the viability of any endangered species. UK Export Finance’s role is to ensure no viable export should fail for lack of finance or insurance. It meets with UK companies every day to assess how it can support their export ambitions. In March 2015 it met with Tullow Oil to share information on UKEF’s products and services. On this occasion the meeting (and subsequent correspondence) did not lead to an application by Tullow Oil for UKEF support. UKEF is committed to high standards of environmental, social and human rights risk management. UKEF follows the OECD Common Approaches for Officially Supported Export Credits and Environmental and Social Due Diligence (OECD Common Approaches) and the Equator Principles – which inform how Export Credit Agencies and International Financial Institutions, such as UKEF, should address potential environmental, social and human rights issues. UKEF has a specialist environmental, social and human rights advisory team that reviews the environmental, social and human rights risks and impact of projects before UKEF takes a decision on support. Projects with potential environmental, social and human rights risks and impacts are reviewed against international environmental and social benchmark standards – such as those of the International Finance Corporation of the World Bank Group (IFC Performance Standards on Environmental and Social Sustainability). As of April 2016 we adopted the Equator Principles to give UK exporters supported by UKEF confidence that environmental, social and human rights issues that may carry ethical or reputational risk have been given consideration as part of UKEF’s support to relevant projects. The Murchison Falls National Park corresponds to IUCN Protected Areas Management Category number 2. This category does not stipulate that an industrial activity is forbidden, as long as it is compliant with this category’s requirements, namely biodiversity preservation. In this specific case, our activity in the Park is allowed by Uganda. However, Total recognizes that it is a challenge to operate in the Park, and has accepted to do so on the basis of trying to pro-actively create a project that demonstrates how oil can be extracted while respecting the environment and the ecosystem, in line with the requirements of IUCN category 2. Our goal is to leave MFNP in a better state than we found it when oil production ceases, ie with a net gain in terms of biodiversity. In this regard, we adhere to both national and international regulations on environment protection. We have made a clear commitment to applying international good practices to the development of the oil resources as exemplified by the International Finance Corporation (IFC) Performance Standards, also known for being the most stringent standards on environment and biodiversity. Internally, we have developed a biodiversity charter whose principles guide our work in the Murchison Falls National Park and the surrounding landscape. – an independent Biodiversity and Livelihoods Advisory Committee comprising of national and international experts in the field of biodiversity and environment management to ensure that operations are carried out with respect to the environment and biodiversity. – National Environment Management Authority (NEMA) and other regulatory authorities in a long-term partnership to ensure compliance with Environment Impact Assessments (EIAs) prior to any activities. We are currently working in collaboration with the Giraffe Conservation Foundation Trust on a one year project to understand the ecology and distribution of Giraffes in MFNP. This is the first time such an intensive study is being undertaken on these giraffes. The production scheme will take our studies into account. The wells (the number of which remains to be determined, see above) will be positioned in accordance with these findings. The report you mention is a not an impact assessment report but a day-to-day compliance report, highlighting deviations identified during the seismic operations against the protocol we had in place to mitigate our impact on environmental features. The seismic operations lasted for one year (may 2013/may 2014), in advance of which a total of 20,855 features were mapped. Despite the measures in place we faced a total of 283 non-compliances versus our protocol. The term “non-restorable” was used for features that could not be artificially restored such as termite mounds, trees, vegetation, etc. as these are known to regenerate naturally.